Investor sentiment was bullish during early trading at Colombo Bourse on Thursday the 24 February 2011, but turned stagnant to close on a mixed note. All Share Price Index (ASPI) gained with continued interest on counters such as GLAS, LGL, LWL etc. However, stagnation of Milanka Price Index (MPI) remained with bluechips yet to attract investors according to brokers. The All Share Price Index (ASPI) closed at 7,583.42 points, rose 0.46% by 34.56 points and the Milanka Price Index (MPI) closed at 7,176.06 points, dipped 0.07% by 05.07 points during the day. 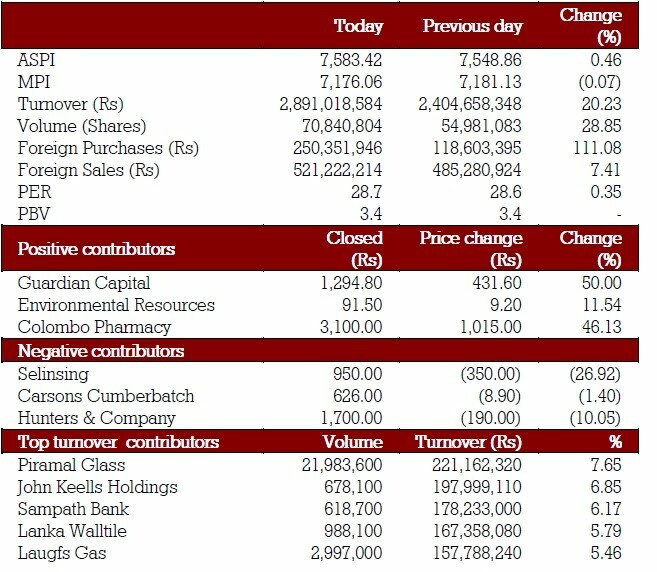 Total turnover was at Rs.2.9 billion (up 20.23%) with 110 listed gainers and 113 listed losers. A volume of 70.84 million shares changed hands (rose 28.85%) foreign purchases rose 111.08% to Rs.250.35 million and foreign sales slightly increased 7.41% to Rs.521.22 million. Price to foreword Earnings Ratio (PER) appreciated by 0.35% to 28.7 times. Manufacturing and Bank, Finance & Insurance sectors were the highest contributors to the market turnover. Manufacturing sector index increased by 1.71% while Bank, Finance & Insurance sector index decreased by 0.22%.Piramal Glass (GLAS) made the highest contribution to the market turnover while the share price increased by Rs.0.70 (7.37%) and closed at Rs.10.20. 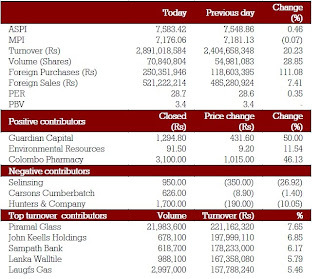 Several Crossings were recorded including John K eells Holdings (JKH) two crossings of 317,300 at Rs.292, Sampath Bank (SAMP) three crossings of 400,000 shares at Rs.288 per share, Lanka Walltile (LWL) 200,000 shares at Rs.170, Cargills (Ceylon) (CARG) two crossings of 200,000 at Rs.234 and Commercial Bank (COMB) two crossings of 250,000 at Rs.274 and Ceylinco Insurance 56,800 at Rs.550 per share. John Keells Holdings (JKH) announced a second interim dividend of Rs.1 per share.Sri Lanka Telecom (SLTL) announced a first & final dividend of Rs.0.60 per share. Globally, European stocks fell today as the political crisis in the Middle East and North Africa continues, although signs of strong growth in the global economy offer a degree of comfort.FTSE 100 opened down 0.8%. Sri Lankan Secondary Debt Market Treasury bond yields were slightly down, while the market activity was dull. Sri Lankan Rupee appreciated as the exchange rate was recorded at Rs.110.76 to Rs.110.78 per US Dollar.